We tested two of the best indoor basketballs to help you decide which to buy. Throughout our tests, the Wilson Evolution Indoor Game Basketball proved to be the king of indoor basketballs as it had more grip, a better sweat wicking surface, and was slightly cheaper than the Spalding TF-1000 Classic. Walk into any basketball gym, and you will undoubtedly see it littered with all different types and brands of basketballs. The vast amount of options can make the decision for buying an indoor ball very daunting. We decided to take two of the most popular indoor basketballs and test them against each other to help make your buying decision a little easier. 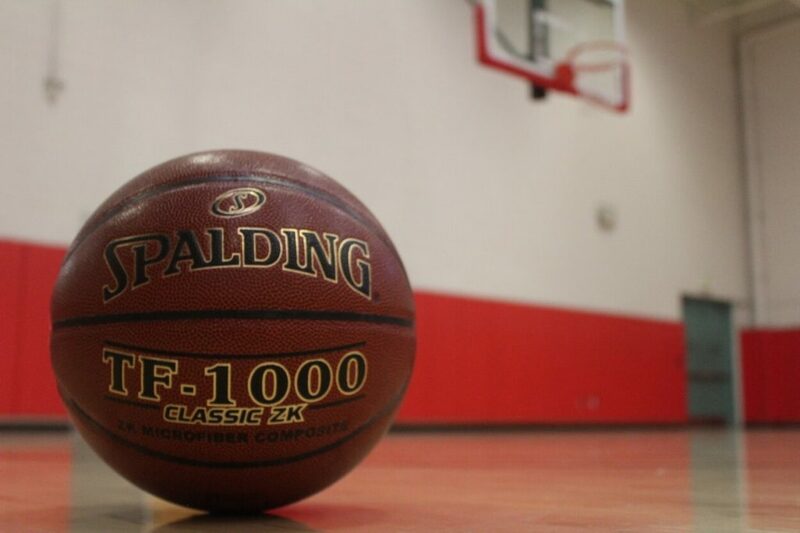 First, a little background information on the different kinds of basketballs is key in determining which type to buy. 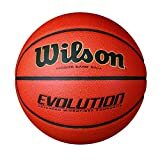 Wilson Evolution Game Basketball, Official - 29.5"
Indoor Basketballs are typically made of genuine leather or composite microfiber leather while outdoor basketballs use a more durable rubber compound. There are also hybrid indoor/outdoor balls that use a mix of synthetic leather and rubber, creating a ball that has decent grip and decent outdoor durability. Due to their differences in material, indoor basketballs tend to have more grip, but less durability than outdoor or indoor/outdoor basketballs. The superior grip of indoor basketballs allows players to shoot and dribble with better consistency. Any sanctioned basketball game (whether it be high school, college, or NBA level) will use an indoor basketball as the game ball. If you are a part of a high school or college basketball team, it is essential to practice with an indoor basketball in order to replicate the feel of a game ball. An indoor basketball is a necessary investment for anyone who plays indoors often and wants to seriously improve their game. First off, we want to address why we didn’t decide to go with the official NBA Game ball: the Spalding NBA Game Ball. This ball is made of genuine leather, and can cost anywhere from $120-$150. Besides the crazy price, any level of basketball lower than the NBA uses a composite leather basketball. So unless you are training for NBA games, we suggest a composite leather indoor basketball. 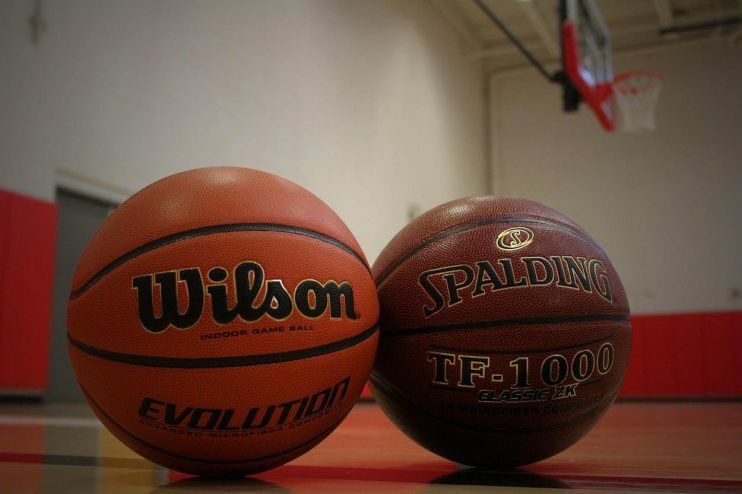 The two most popular composite leather basketballs are the Wilson Evolution and the Spalding TF-1000 Classic. The Wilson Evolution dominates the market for indoor basketballs right now. Every open gym seems to have them. Many high school basketball associations use this ball as its official game ball. We chose to test this ball based on the extensive amount of positive reviews on the ball, and the fact that it is the most widely used High School Game Ball. Additionally, we have had very good personal experiences using this ball for indoor play. The Spalding TF-1000 used to be the darling of the indoor basketball world. It was a highly praised ball with tons of grip that only got better as the ball was used more. For some reason unknown to our team and 99% of people who love basketball, Spalding changed its formula for creating the TF-1000. The new formula gave the ball a rubbery feel and ruined the ball’s grip. Negative reviews flooded the internet, prompting Spalding to try to “re-create” their original formula – leaving us with the TF-1000 Classic. Reviews for this new ball have been mostly positive, however, it seems that it still can’t quite live up to the original formula. We decided to test the TF-1000 Classic to see if this “re-created” legend can knock the Wilson Evolution off the indoor basketball throne. Both of these balls are fairly pricey. The Wilson Evolution will set you back anywhere from $45-$60 and can be had in either the Official NBA size of 29.5” or the WNBA/intermediate size of 28.5”. Meanwhile, the Spalding TF-1000 Classic can be had for $55 – $80. 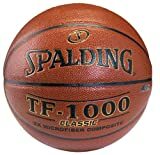 Yes, you read that correctly, this ball can be bought for as low as $50 from Amazon or if you decide to buy directly from Spalding’s website, you will be charged a hefty $80 price tag. The Wilson Evolution wins on pricing. We received both of these balls fully inflated in the mail (albeit not to the correct pressures). Strangely, the Spalding TF-1000 Classic did not come with any box or container surrounding the ball, while the Wilson Evolution came with a nice box container for the ball. The differences in these two balls can be felt immediately. The Evolution feels grippy and game ready right out of the box. It also has a soft and “semi-squishy” surface that aids your grip on the ball. The TF-1000 Classic feels slightly slippery, with a harder, rubber-like feel. The surface of the TF-1000 feels more like the surface of a indoor/outdoor ball rather than an indoor only ball. We definitely liked the initial feel of the Wilson. It feels expensive in your hands, and it feels game ready right out of the box. The Spalding, on the other hand, made us wonder if Spalding had really messed up their new formula. In no way does the surface of the Spalding feel game ready, and it felt like Spalding had put some sort of “spray” on the ball to try to add grip. The Wilson Evolution gets our vote for the first impressions. As you can see, both balls were proficient at wicking the water away. The Wilson Evolution was able to wick away slightly more water than the Spalding TF-1000 Classic, as the Evolution had an average of 0.05 oz. left on the ball while the TF-1000 Classic had an average of 0.0625 oz. left on the ball. The Wilson Evolution wins the moisture wicking test. Nothing is more annoying than constantly having to pump your ball full of air. That is why we wanted to test how well these basketballs are able to hold air. 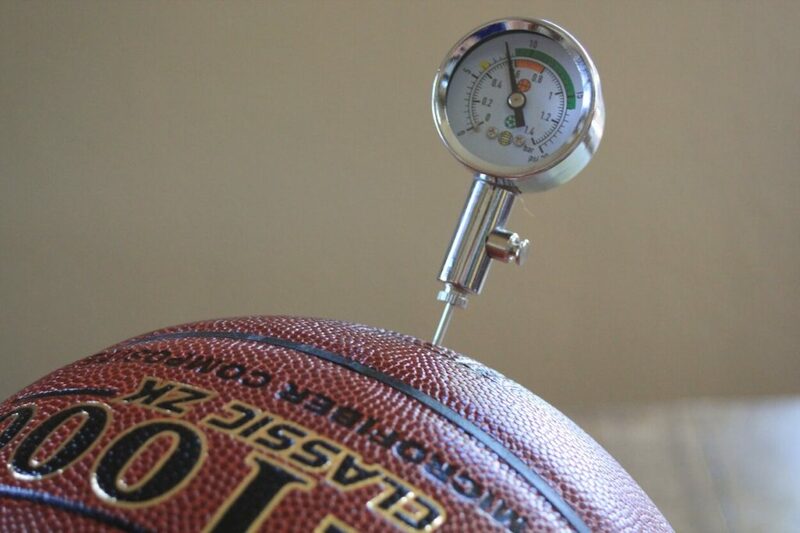 Now, the NBA states that the official Pressure (or PSI) for a game ball needs to be between 7.5 PSI and 8.5 PSI. Given this information, we filled both basketballs up to 8 PSI and placed them in a 75°F temperature-controlled room. After 3, 5, and 7 day periods we tested the pressure in each basketball using a ball pressure gauge to see the amount of pressure that was lost. Surprisingly, neither basketball lost any measurable pressure during this time period. It’s safe to say that both the Wilson Evolution and the Spalding TF-1000 Classic will retain air pressure sufficiently. Next we tested how “bouncy” each ball was. Now this test isn’t actually a factor in terms of determining which ball is better because everyone has their own preference on if they like a more bouncy ball. It is an important test because typically a more bouncy ball will be less forgiving when it hits the rim. It will tend to bounce off of the rim harder and farther. For this test we held each ball 57” above the ground and dropped them at the same time (both balls had identical pressure of 8 PSI). The Wilson Evolution bounced back up 33” while the Spalding TF-1000 Classic bounced back up 32.” The WIlson Evolution proved to be slightly bouncier than the Spalding TF-1000 Classic, but the results are almost negligible. We wanted to measure the grooves of each ball to give you a good idea of which ball has deeper or wider grooves. Generally, the wider and deeper the grooves of a basketball are, the easier it is to shoot. This is because the wide and deep grooves allow a shooter to find and grip the grooves easier (most shooters will shoot the ball with the grooves perpendicular to their hand). We measured the width of the grooves of each basketball in two ways – we measured the width black rubber seams and then we measured the width of the entire groove of the ball (where the surface starts to dip to create a groove). We then measured the depth of each basketball’s groove. Our measurements were taken using an electronic digital caliper for the most accurate results. As you can see, the Spalding TF-1000 Classic had a much wider overall Groove with less depth than the Wilson Evolution. Our personal preference would be the Spalding’s wider grooves that make it easy to find the right grip, but are not too deep to the point where it negatively affects our shot. Once again, this is just our preference, and every player will have their own preference. Grip is probably the most important factor in choosing an indoor basketball. Unfortunately, there is no realistic way for us to measure the grip of each basketball. So we decided to use each basketball indoors for a week and see what we thought of the grip of each ball. Although a great ball in its own right, we can in no way justify recommending the TF-1000 Classic over the Wilson Evolution. Now, if the TF-1000 Classic were in the $25-$35 range, that would be a different story, but there is no reason to spend more money on an inferior ball. 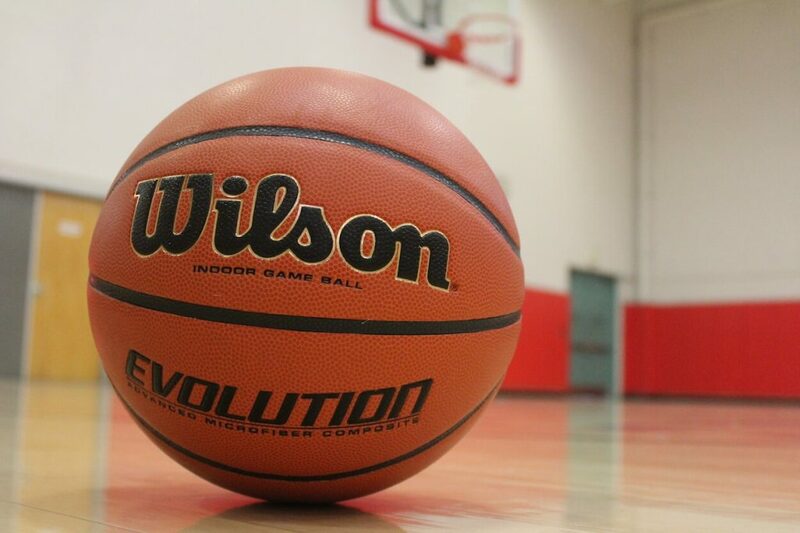 We recommend the Wilson Evolution for anyone looking to buy an indoor basketball. It beat the TF-1000 Classic in all of our tests, and keeps its place as the king of indoor basketballs. There is a reason it remains the best selling indoor basketball – it’s an amazing ball worth every penny of its price tag. Should you purchase an indoor basketball, we wanted to provide you with some tips for maintaining your ball for long-lasting use. Use your ball only on indoor wooden surfaces. Store your ball inside when it is not in use. Wipe away dirt from the surface of the ball after use (use a slightly damp cloth). Keep the air pressure between 7.5 PSI and 8.5 PSI. Play with the basketball outdoors or on any non-wooden surface, this can cause the material to tatter. Store the ball outside or in any extreme temperature places (ie trunk of your car). Soak the ball in any liquid. Over inflate the ball (anything greater than 8.5 PSI). Mistreat the ball by kicking the ball or sitting on it, which may cause it to warp. 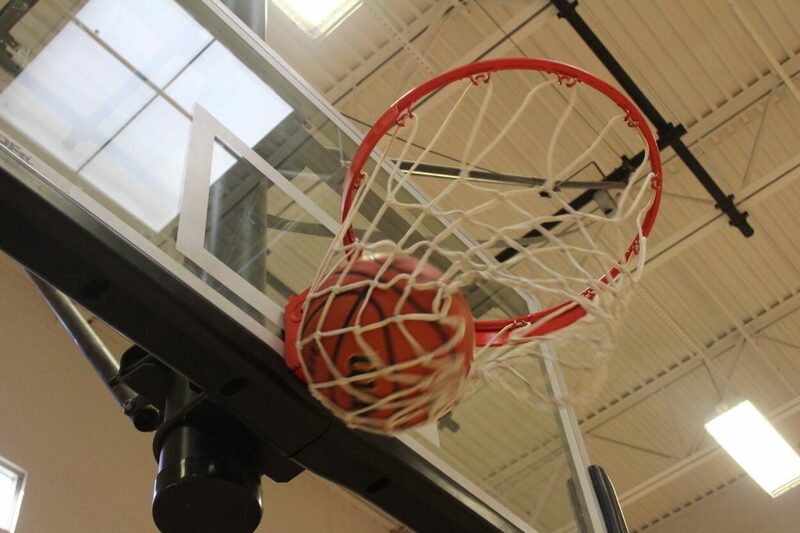 Whether you are a top high school or collegiate recruit, or an average Joe who loves to play on the weekends at your local open gym, an indoor basketball is a great investment to take your game to the next level. When sorting through the countless brands and types of basketballs, you will no doubt stumble upon the Wilson Evolution and the Spalding TF-1000 Classic. We believe the Wilson Evolution to be the best indoor basketball as it is great at wicking away moisture, retains its air pressure very well, and has amazing overall grip. So get up, grab a water bottle, a Wilson Evolution, and go ball. Take your game to the next level with the best indoor basketball – The Wilson Evolution. If you are looking to improve your ball handling, checkout our comprehensive list of the best basketball dribbling drills!